Skywatcher and photographer Nick Rose snapped this stunning view of a Perseid meteor from Millbrae, Calif., on Aug. 10, 2011 as the annual Perseid meteor shower neared its peak. Skywatchers around the world caught stunning views of the Perseid meteor shower overnight Friday (Aug. 12) despite a bright full moon that threatened to outshine the annual "shooting star" display's peak. The Perseid meteor shower is often the most dazzling meteor shower of the year, but a fluke of timing put the peak of this year's space rock light show in competition with the August full moon. But accounts from skywatchers suggest the Perseids did not disappoint, despite the moon's interference. Skywatcher Carolyne Jackson of Woking, Surrey in England snapped this amazing photo of a Perseid meteor from her backyard during the peak of the 2011 Perseid meteor shower on Aug. 12, 2011. The Perseid meteor shower has been observed by skywatchers for at least 2,000 years, according to NASA. The meteors are actually pieces of the comet Swift-Tuttle, which orbits the sun once every 133 years. The meteor shower gets its name Perseid from its origin point in the night sky: the constellation Perseus. Every August, Earth flies through the comet's cloud of debris and the tiny bits of Swift-Tuttle (most of them more than 1,000 years old) burn up in the atmosphere as they streak at nearly 133,200 mph. According to the website Spaceweather.com, international observers reported up to 20 meteors per hour during the Perseids' peak. "Saw 5 here in Brooklyn," New York City skywatcher Miloy Quezada wrote in a post to SPACE.com's Facebook page. "We were laying on our building's roof, my 2-yr-old couldn't figure out what his dad and I kept pointing at. At first it feels like your eyes are playing tricks on you. It was great to see God's amazing creations." Just outside New York City, in West Orange, New Jersey, two dazzling fireballs marked the highlight of the Perseid meteor shower, as seen by this reporter. NASA held an online skywatching party for the Perseids, providing a live camera view where meteors streaked across the frame of an all-sky camera at the agency's Marshall Space Flight Center in Huntsville, Ala. NASA astronomer Bill Cooke and his fellow meteor scientists Danielle Moser and Rhiannon Blaauw hosted a webchat for the Perseids to answer questions from what seemed to be a throng of eager skywatchers online. In addition to the Perseids and the nearly full moon of August, and is known as the Full Sturgeon moon among other names, the International Space Station also made an appearance in the Friday night sky. Cooke snapped an eye-catching photo of the space station streaking over Huntsville using one of the Perseid all-sky cameras and posted it on Twitter, where he posts updates as @MeteorScientist. "ISS pass over Huntsville at 9 tonight," Cooke wrote. The space station is making a series of passes over the United States this week. Here are some tips to spot the space station in the night sky. NASA meteor scientist Bill Cooke posted this image of the International Space Station streaking above Huntsville, Ala., on Aug. 12, 2011 during the peak of the Perseid meteor shower of 2011. Some of the best views of the Perseid meteor shower actually occurred earlier this week, when the moon was not at its brightest and therefore didn't wash out the shooting star display. 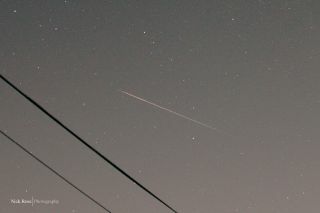 "With around 90 or so photos I took this morning only one of them had a Perseid meteor," Rose told SPACE.com in an email. "Even though Perseus is in the direction of the San Francisco International airport with a lot of [light pollution] I was still able to get a pretty good photo." Back in New York City, skywatcher Peter Orrick was amazed at what he saw on Aug. 10. "I was in Central Park and noticed a bright streak across the sky crossing from east to west then it split into two streaks!" Orrick told SPACE.com in an Aug. 10 email. "I'd never seen a meteor that bright!" Editor's note: If you snapped an amazing photo of a Perseid meteor this year and would like to share it with SPACE.com for our Perseids 2011 gallery, please send them to managing editor Tariq Malik at: tmalik@space.com. See a list of the remaining meteor showers of 2011 here.